Click the button below to add the New Flat Black Cloth Seat Covers Full Set with 4 Embroidery I Love My Dog, Paws Logo Headrest Covers - Shipping Included to your wish list. This bundled product includes the 9 piece Black Cloth seat and headrest cover set plus 4 I Love My Dog Paws Headrest covers. 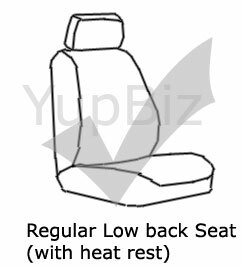 A normal seat covers logo is often located at lower position which can hardly be seen unless standing fairly close to the vehicle. It will also be blocked when sitting on the seat which eliminates that chance for other people or even yourself to view it. When you purchase a seat cover with certain logos you wanted it to be seen easily either by yourself or other people who pass by your vehicle. With the Interchangeable Headrest Covers the logo design can be seen from hundred yards away and every time you look over your shoulder. Made by soft polyester with padded foam that comes in by a pair with great designs to chose from. Purchase the deigns desired and place them on your vehicles headrest (only available for low back type seats with the removable headrest) and interchange them from day to day with the desired design. New universal size car seat covers set made with durable black color fabric provides perfect protections for your car seats. Soft and durable fabric with 4mm extra thick foam (compare to other similar product which only come with 2 to 3mm foam padding) ensures the maximum comfort. Front seat covers with 2 pockets allow driver or passenger to store and access their cell phone, mp3 player or other personal belongings with ease. Reduced side design allows upper side airbags to deploy without resistance. Rear cover supports center console and split type seats in 50/50 and 60/40 ways. 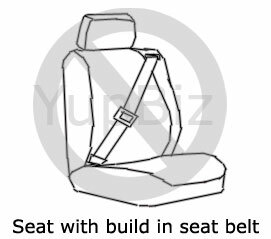 Note: This combo set does not fit vehicles with large size seats and headrests. Bundled Combo Set includes: 4 Interchangeable headrest covers with logo, 2 front seat covers, 5 base head rest covers, rear bench cover, rear back (top) cover, metal hooks. Note: Since these 2 products were made by different manufactures, there is a slight difference on the material which causes a shade of color differentiation between the two products that is hardly noticeable. Start to make your collection of these headrest covers for yourself or give them as a gift set and get ready for the unique and personal look on your vehicle that will inspire people with their first sight. Note: These headrest covers do not fit large size headrests. If you have any question, please contact us at 866-989-6628 Local pick are welcome, our store hours are 9:00AM to 5:30PM Monday to Friday PST. 2000 2001 2002 2003 2004 Nissan Altima Seat Covers Floor Mats Set ALL FEES INCLUDED!